In the 1980s I participated in a “dialogue” about anarchism and Marxism. Re-reading my writing now, when I am a revolutionary anarchist, I think that much of what I wrote then was wrong–with one exception. I went over certain key issues, such as the strengths and weaknesses of Marxism, the state, the revolutionary party, election participation, and national liberation–topics which are still important for anarchists and other radicals to consider and debate. Originally published by Anarkismo. Written by Wayne Price. In 1985, I participated in a “dialogue” between the unorthodox-Trotskyist organization I was then a member of and an anarcho-syndicalist organization. The topic was “Where do anarchists and Marxists differ, and can we learn from each other?” From my current perspective as a revolutionary anarchist, I now believe that much of what I then said was wrong. By the mid ‘fifties, the radical organization I was a member of—the Revolutionary Socialist League—no longer felt comfortable describing itself as Trotskyist or Leninist. We had held a libertarian-democratic-proletarian interpretation of Marx, Lenin, and Trotsky. Almost all the other Marxists interpreted them as authoritarian and statist (and were for this). We were no longer sure that we alone had the correct (radically democratic) interpretation of Marx and key Marxists, while most everyone else was wrong. To help us reassess our politics, we reached out to the anarchist movement. We participated in several continental anarchist gatherings. We made contact with members of the Workers Solidarity Alliance (then the Libertarian Workers’ Group in New York). Like us, they were revolutionary and based their politics on working class struggle, while supporting other struggles against oppression. This led to a forum where both organizations expressed their views, later reprinted in the WSA’s journal, ideas & action, (Winter 1985, no. 5; pp. 16—27). I spoke for the RSL and Mike Harris for the soon-to-be-WSA. At the time I was in the process of developing my thinking, as were others in the RSL. We had never been orthodox Trotskyists. We never accepted Trotsky’s opinion that the Soviet Union under Stalin was still somehow a “workers’ state” due to its nationalized property. Instead, we had developed a version of “state capitalist” theory. We had always emphasized what we saw as the radically-democratic and libertarian aspects of Marxism. This included the goal of a classless and stateless society and the view that the working class must free itself rather than rely on elite saviors. We downplayed the authoritarian aspects. We had strongly supported women’s liberation and LGBT liberation. Re-reading what I said and wrote about 25 years ago, I find that I still agree with the basic values expressed then. With my other comrades, I was for a bottom-up international revolution of the working class and all oppressed people, to create a free, cooperative, ecologically-balanced, and radically democratic society. I still am. But on almost all the specific questions in this discussion, I was mostly wrong—with one significant exception. Such teleological determinism leads to authoritarianism, opportunism, sectarianism, and elitist repression. Whether it is a “fair” interpretation of Marx is beside the point. This fatalist determinism does appear in some aspects of his work (even if not in all of it). It was adopted by the mainstream of the Marxist movement (both social democracy and Stalinism) and even by some of the more libertarian Marxists. While this criticism of Marxism is an important insight, it is somewhat abstract. I should have also pointed to the weaknesses in Marx’s program. Marx believed in workers’ democracy, but he saw this as being implemented through a centralized state. He advocated that the workers establish a party which would take over the state—either the old one through elections or a new one through revolution. The state would nationalize and centralize the economy. He predicted that this state would—eventually—die out as a repressive, class-based, institution. But there would still be some sort of (presumably benevolent) centralized planning body. This was stated in the Communist Manifesto and never fundamentally altered. Some of Marx’s work pointed in a more radically democratic and decentralist-federalist direction, such as his writing on the 1871 Paris Commune. But right after the defeat of the Commune, he began a campaign to get the First International to establish workers’ parties in every country it could, in order to run in elections and to try to take over the existing European states. The anarchists opposed this state-oriented, centralizing, program, which is why Marx expelled Bakunin and other anarchists from the First International. However much Marx believed in workers’ democracy, his program naturally led toward the pro-imperialist, statist, reformism of the social democrats and then to the totalitarian state-capitalism of Marxism-Leninism. I agreed with the radically-democratic version of Marx’s view of the state, which still accepted the need for a state. Our interpretation was based on his writings about the Paris Commune, and on Lenin’s State and Revolution (Lenin’s most libertarian-democratic work). Like anarchists, we believed that the existing states (the capitalist states) should be destroyed by the workers and oppressed and replaced by new, participatory-democratic institutions. Workplace councils, community assemblies, democratic militia units, and voluntary associations, should federate to create a new social power. This would be different from any state which had ever existed, because it would be the self-organization of the big majority. It would not be a bureaucratic-military-police elite machine, standing apart from and over the people, serving the interests of a ruling minority. It would not be the traditional state. I am still for this perspective. However, like Lenin I continued to call this popular institution a “state” (the “commune-state”). I recognized the need for institutions to carry out certain tasks which the state had done in class society: social coordination, cooperative decision-making, protection against armed capitalist restorationists and against anti-social individual actors, etc. But as anarchists pointed out, by calling the proposed council-system a “state” I denied the big differences between the self-organization of the workers and the repressive elitism of all past states. By accepting that the working class needed a “state,” then—like Lenin—I opened the way to accept more bureaucratic—statist—forms of a “state.” Lenin wrote in State and Revolution that the revolutionary state would “immediately begin to wither away,” but when he got into power he (and Trotsky) created a one-party police state. This laid the basis for Stalin’s totalitarianism. In my essay, I quoted several of Lenin’s more libertarian-sounding statements, without clearly stating my opposition to the main aspects of his strategy, especially his state-building. I made a similar mistake when discussing “the party.” I believed that revolutionary libertarian socialists should gather themselves into a democratic federation. This would help them to develop their theory and programs and to coordinate their activities, as they worked among broader organizations (unions, community groups, anti-war movements, etc.). This is sometimes called“dual-organizationalism.” In anarchism, it goes back to Bakunin’s Alliance for Socialist Democracy, to Malatesta’s arguments with the syndicalists, to Makhno and Arshinov’s “Platform,” to the Spanish FAI, and to Latin American especifismo. It is not counterposed to the self-organization of the workers and oppressed but is a part of the process. Yet I (mistakenly) continued to call this a “party.” This overlooked the difference between this conception and that of the traditional “revolutionary vanguard party” of Leninism. The anti-authoritarian revolutionary political association does not aim to take over the popular organizations. It does not aim to “take power” over society, through either elections or revolution. It does not want to create a new state. Rather it urges the people to organize themselves, to take over society for themselves, to form self-governing mass movements, and to reject the elitist politics of all the political parties (left, right, and center) which do want to become the new rulers. On elections, again, my comrades and I were in general agreement with the anarchists in the abstract. We rejected “electoralism” (or “parliamentarianism”), the belief that the working class and oppressed could take over the state through elections, and then use the state to begin socialism. “U.S. capitalist democracy was not built so that workers could take capital away from the capitalists.” (22) It was built so that the factions of the capitalist class could resolve conflicts and make decisions (without relying on a dictator or civil war), and so that the working people could be fooled into thinking that they run society themselves. In particular, the Democratic Party has repeatedly served as a trap to capture left-moving movements, to enmesh them in state and capitalist politics, and to kill them off. However, I still thought that it could be useful for a revolutionary grouping to run in elections, not to get elected but to use them as platforms to spread revolutionary ideas. I did not consider that this also spread the idea that even revolutionaries believe that elections are real reflections of popular power. It also spreads the idea that people should rely on political leaders to speak for them, to lead them, and to be elected in order to go to far-away places in order to be political for them. I also spoke of the possibility of a U.S. labor party or a Black party, in which revolutionary libertarians should participate. I did not consider that such parties, in personnel and in programs, would continue the reformist, pro-capitalist, politics of the Democratic liberals, union bureaucrats, and African-American “community leaders.” This would simply be a third capitalist party, existing to head off independent mass action by a rebellious population. Like Sanders or Warren today, their programs would be wholly inadequate to deal with the crises we face. I actually used the example of the German Green Party, as something which—if it developed in the U.S.—we would want to participate in. Since then, the German Greens have been ministers in the German imperialist government. Following the logic of government-participation, they have supported foreign wars and generally betrayed their principles. Nations exist and people identify with their nations (whether we want them to or not). A minority of nations oppress the people of other nations. Some nations are directly oppressed by other countries which occupy and “own” them, as was true under colonialism. This is still the case for Palestine, the Kurds, Puerto Rico, Tibet, Chechnya, and so on. Under modern neo-colonialism, most nations have political independence but are dominated politically and economically by the big imperialist powers. The people of such nations (who are mostly workers and peasants) do not want to be dominated and exploited by the ruling classes of other countries. They want national liberation. They want to decide their own fate (“national self-determination”). There are various programs which are proposed for such liberation. The most common is “nationalism.” This is the belief that the main issue is the oppression of the nation, which is treated as a bloc, downplaying divisions of class, gender, religion, or minority nationalities. Its goal is for each people to have its own national state and national economy (traditional capitalist or state capitalist). This results in a new ruling class and state with the continuation of internal exploitation, and continuation of international exploitation by the world capitalist market (dominated by the U.S. and other imperialisms). Revolutionary libertarian socialists reject the program of nationalism. We oppose the nationalist misleaders of the struggle who will take the people into this dead-end. Instead, we believe that only a world-wide revolution of the working class and all oppressed people can free all nations, end all imperialism and national oppression, and bring about true national liberation—along with other freedoms. That is our program. We are for saying this. Our attitude is similar to our solidarity with workers who go on strike under the leadership of a conservative business union. We criticize the union’s bureaucrats and conservatism, we oppose its leadership, but we are in solidarity with the workers. And if the state jails union officials, we “support” the bureaucrats against the state and the capitalists in the immediate situation, because this is really an attack on the workers. But we are the political opponents of these officials. Errico Malatesta was an influential Italian anarchist who had been a comrade of Bakunin and Kropotkin. He wrote, “We are internationalists…so we extend our homeland to the whole world…and seek well-being, freedom, and autonomy for every individual and group….Now that today’s Italy invades another country [Libya—WP]…it is the Arabs’ revolt against the Italian tyrant that is noble and holy….We hope that the Italian people…will force a withdrawal from Africa upon its government: if not, we hope that the Arabs may succeed in driving it out.” (In Turcato 2014; 357) This did not imply agreement with the Arabs’ leadership. During the wars which followed the Russian revolution, Nester Makhno and other anarchists organized a military resistance in Ukraine. Their forces opposed the capitalists and landlords, integrating these class issues with a Ukrainian national war against German, Polish, and Russian invaders. Similarly, during World War II, Korean anarchists organized a military resistance to the Japanese invaders. 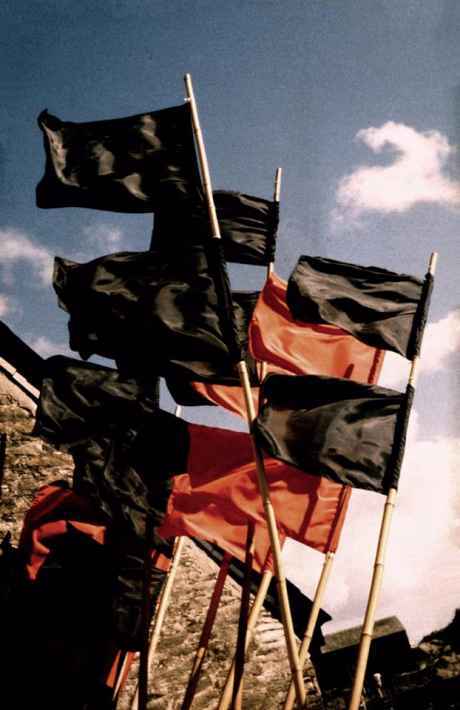 As Lucien van der Walt summarizes, “One anarchist and syndicalist approach…was to participate in national liberation struggles, in order to shape them, win the battle of ideas, displace nationalism with a politics of national liberation through class struggle, and push national liberation struggles in a revolutionary direction.” (van der Walt & Schmidt; 2009; 310–311) That means, in a revolutionary, internationalist, libertarian socialist, direction. The Revolutionary Socialist League continued for a while, until it dissolved, with some of its members joining anarchist organizations (Love and Rage, then NEFAC, etc.) Some former members now put out the journal The Utopian. We did not merge with the Workers Solidarity Alliance, which continues to exist. I came to identify myself as a revolutionary anarchist, who has been influenced by libertarian-autonomous Marxism. Over time I have changed my views more often than I like to admit, always trying to do better. I am not ashamed of my mistakes. My values and overall goals remain the same.